The building of this ancient church was started in 1106, probably by St. Anselm who owned the nearby Slindon ‘Palace’. Archbishop Langton (a signatory of the Magna Carta) died there in 1228. Holy Communion (both Book of Common Prayer and Common Worship) is celebrated two or three times a month. There is a service in St Mary’s Church every Sunday following a monthly pattern: Prayer Book Matins with Holy Communion (1st Sunday 11.00 am); Family Service (2nd Sunday 9.45 am); Common Worship Holy Communion (3rd Sunday 11.00 am); and Prayer Book Evensong (4th Sunday 6.30 pm, and during Winter months the earlier time of 4.00 pm). The Venerable Philip Jones, The Rectory, Dyers Lane, Slindon. Tel: 01243 814275. Mrs Barbara Brimblecombe. Tel: 814285. Mr Tony Richards. Tel: 814735. 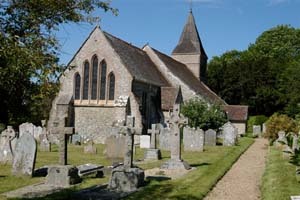 The Church of St Richard’s was built in 1865 and stands at the top of the village opposite Slindon College. It serves the Roman Catholic parish of Bognor Regis with Barnham and Slindon. The church was designed by C A Butler and built by Robert Bushby of Littlehampton following a bequest by the Earl of Newburgh. There is a stained glass window to the memory of the Countess of Newburgh above the high altar. 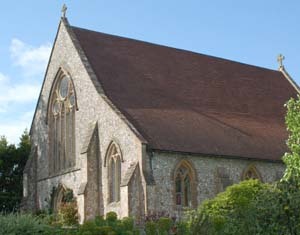 Although the Church is only 150 years old, the Catholic Mission in Slindon dates from the Reformation. Mass is celebrated every Sunday at 9.00 a.m.
Father Chris Bergin. Tel: 01243 823619. Correspondent: Pauline Webber. Tel: 01903 722230.